How To Drive A Manual Transmission/Stick Shift - 2. Today we'll learn how to start and get your car moving. 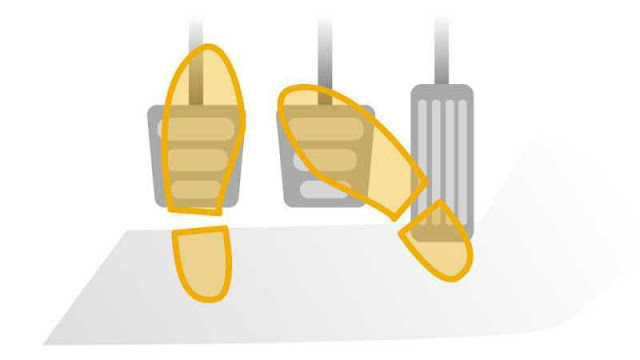 - Adjust the seat position forward enough to allow you to press the clutch pedal fully to the floor with your left foot. - Then press down on the clutch and put the gear in neutral just like automatic transmissions require the brake to be depressed so the car does not leap forward upon starting the car. Note: The vehicle is considered out of gear when the gear is in the neutral position or the clutch pedal is fully depressed. - Start the engine with the key. Don't worry, as far as the gear is in the neutral position, your car won't move. * GETTING THE CAR TO MOVE. - Press the clutch to the floor completely again and move the gear to the first gear. (You must have noticed the visual layout of the gear pattern on top of the gear knob and should have familiarized yourself with the gear positions). - Slowly lift your foot up from the clutch pedal until you feel the car start to shake. Hold it there slightly - this is the clutch travel position known as the "catch point" (Any further release from the clutch with make your car stall and the engine will go off). - While holding it there, the car should start moving forward slowly. - At this point, allow the car to rev just enough to prevent it from stalling as you release your foothold on the clutch then apply little pressure on the accelerator. NOTE: Don't touch the gas/accelerator until you can get the car moving just fine by just releasing the clutch. - If you release the clutch too quickly the car will stall. Slowly remove your leg from the clutch as you apply pressure on the accelerator. If the engine sounds like it is going to stall, then hold the clutch where it is or push it further in slightly. - Once you are comfortable with getting the car to move, keep an eye on your tachometer. Changing gears should occur between 2500 and 3000rpm. If the tachometer is absent in your car, then you have to become one with your car and let it speak to you. The sound of the engine will tell you when to shift. - Between 2500 and 3000 RPM. Clutch in and gas off. Move the shifter smoothly from first to second. - Now slowly off the clutch while pushing on the gas. Completely let your foot off the clutch and gas it up. - Do the same thing to upshift to the next gear. Note: When in motion you should be sure to place the stick all the way into gear until it won't go any further but don't force it. If you stop halfway, you will hear an incredibly unpleasant grinding sound which means your car is not in gear and that could cost you. Also, once in gear and on the gas you should completely remove your foot from the clutch pedal. Some people do develop the habit of resting their foot on the clutch pedal which is bad thereby applying pressure to the clutch mechanism — the increased pressure could allow the clutch to wear prematurely. That's enough lesson for today. Keep trying your hands and feet around that till we meet again. Please do leave your comments and reactions below. The Menace Okada Constitutes To Driving - 2. Peugeot Unveils Its All New Compact 3008 SUV. The New Beast In Lagos. CFAO Yamaha Is Set For A Grand Opening In Lagos.